Forged from chrome vanadium steel hardened, tempered and chrome plated for corrosion protection. Draper HI-TORQ® ring end offset at 15°. Jaw offset at 15°. Supplied in vinyl divided wallet with tie cord. Display carton. 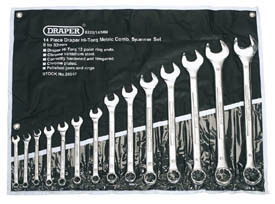 Draper HI-TORQ® is a registered trademark of Draper Tools ltd.